Summer is here and it’s time to celebrate. Berkshire Hathaway HomeServices Crager Tobin Real Estate wants to help you throw the best outdoor parties this summer. Here are a few of our best backyard summer decor ideas for your next celebration. An outdoor setting is perfect with a rustic touch. Use burlap for table runners. Bring out the glass canning jars to hold your guests’ drinks with old-fashioned paper straws. Use benches or old crates for outdoor seating. You can even utilize a wheelbarrow as a rustic cooler and fill it with ice and different beverages. A great way to add a fun touch to your decor is with pops of color. You could add bright curtains to your outdoor living space or screened in porch. Or, restore your boring metal folding chairs with new cushions and fabric to brighten up your seating. A nice outdoor rug with a fun pattern can help make your dining space more vibrant as well. Don’t neglect your flower beds when planning for your next party. To give your BBQ a colorful background, add some annuals to your flower beds. A few petunias, marigolds, begonias and impatiens can take a dull landscape and make it the perfect place for friends and family to spend time together. Adding a colorful trellis for climbing plants would add some texture and height to your garden as well. You are planning a party for 25 people, but only have outdoor seating for 10. What do you do? Get creative! Pull out pillows and blankets for the kids, and utilize benches or other moveable furniture you have inside to fill out the space. If you’re still in need of seating, pull out the foldable chairs in your trunk or ask friends to bring a few with them! 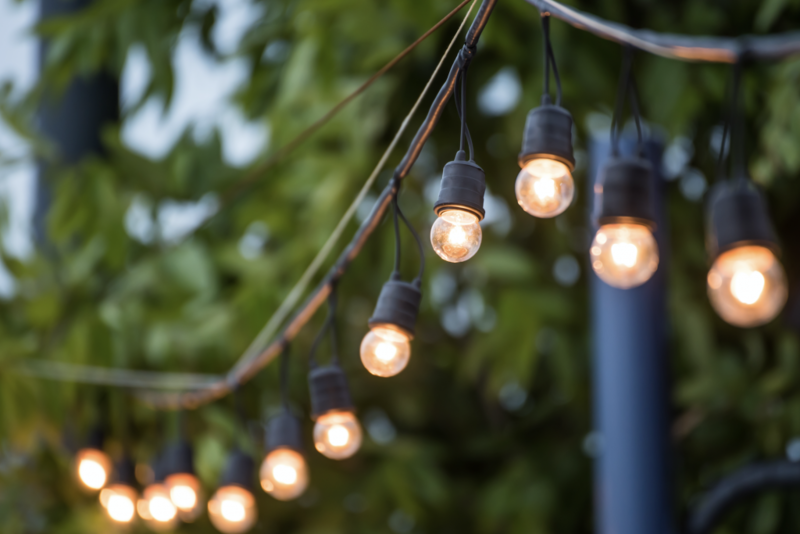 If you’re hosting a nighttime party, you will need lighting as the sun goes down. Rope lights is perfect along the edge of a deck. Tiki torches are a great way to light your space while scaring away insects. You can even hang lanterns or white Christmas lights from your trees for a trendy look. One way to allow for good conversation is by having multiple different areas for your guests to enjoy. This also helps if you invited many different groups of friends, so they can each be comfortable in their own cliques. To partition your space, you can group chairs around your fire pit, put a picnic table by the cooler, and a pile of pillows and blankets on the deck. Feel free to be creative with your space! You can also set up different party games or yard games, which easily creates new areas. Summer weather is fun, but too much sun can make anyone uncomfortable. Offer shady spots throughout the backyard for a break from the heat. Table umbrellas make dining more comfortable and help food stay cool. Popup canopies are a great source of shade. We hope you enjoy hosting summer parties and celebrations with these tips! Of course, if you need a backyard to celebrate in, you can always count on the real estate professionals here at Berkshire Hathaway HomeServices Crager Tobin Real Estate to help you find your perfect home in Central Ohio.